Today we decided that it was a good day to finger paint! Finger painting is often a very messy albeit fun sensory experience for toddlers. To alleviate some of the clean up I put JJ in the bathtub so that he could explore the goopey paint to his hearts content. At only 13.5 months old he is still obsessed with putting everything into his mouth so I made his finger paint as digestable as possible. Here is the recipe. Add a little flour and water to a bowl until you have the consistancy you want. To make it smooth use a whisk to eliminate lumps. Then seperate as many times as you want and stir in food coloring. We started with a bowl of purple and a bowl of blue paint. 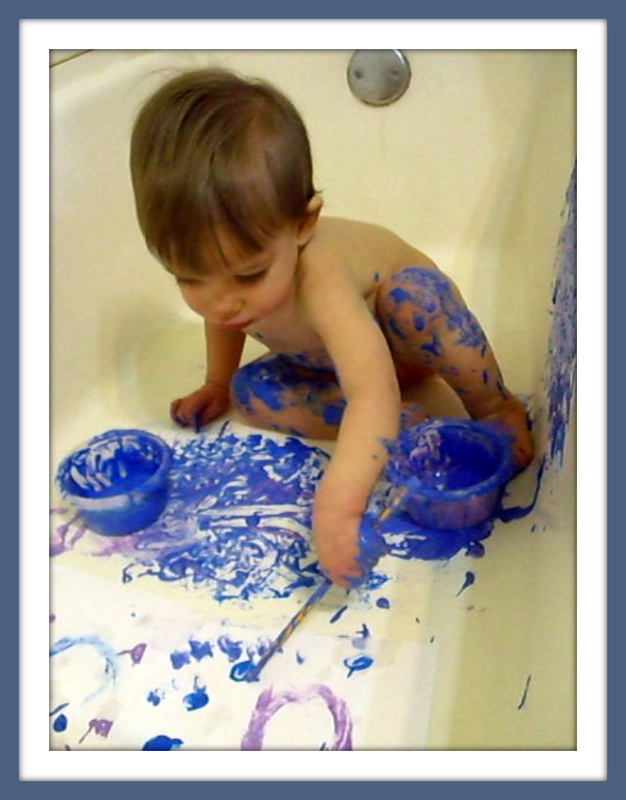 However JJ was mostly just insterested in putting all the blue paint into the purple paint. I then put some of the paint on the wall of the tub and he really enjoyed flicking it up onto the wall and slapping at it. I think he liked the extra wet smacking sound that was created in addition to the familiar hollow thumping sound that is made as he hits the side of the tub during bath time. I also lay down 2 pieces of paper in the tub and wrote the letter J on each. I let JJ paint these so we could preserve his masterpiece.